People, plants and animals all need shelter from extremes of weather. 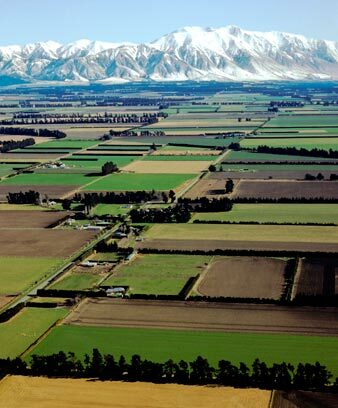 New Zealand farmers have planted their land with shelter belts – lines of trees that protect stock, crops and pasture from wind, heat and cold. Other forms of shelter include native bush remnants, dairy sheds and artificial windbreaks. New Zealand’s climate is warm enough for grass to grow all year, so farm animals can be grazed outside year-round. But animals and plants need shelter from New Zealand’s strong winds. European settlers planted shelter belts – lines of trees to protect their farms, gardens and orchards against wind. make it easier for insects to pollinate plants. Sheep, cattle, deer and farm dogs can rest in the shade in hot weather, and are protected from cold winds in winter. This helps them to stay healthy. In droughts, the foliage of some shelter-belt trees can be cut and fed to animals. Planting certain tree species encourages bees and other helpful insects, as well as birds. Most farm shelter belts are planted with non-native trees – usually radiata pine or macrocarpa. Native trees like lemonwood (tarata) or ngaio can also be used. Shelter belts around orchards are often alder, eucalyptus, poplar, willow or casuarina trees. Shelter belts should allow some wind to go through. This works better than a solid wall. They can be a single row of trees, or two or more rows. To reduce wind, they should be across the direction of the prevailing wind. Planting them north–south stops them casting too much shade. Some trees used in shelter belts have fast-growing roots that invade nearby land. Tall trees may shade a crop, reducing its growth. Some tree species are poisonous to animals, and can make them miscarry their pregnancies. Pests such as possums sometimes live in the trees. Dairy shelters are large sheds where stock can be housed and fed. They are used in winter and spring to keep cows off the pasture for part of each day, and in summer to stop the animals getting too hot. Artificial shelter, made of tall posts and windbreak material, is sometimes built around horticultural crops.